On 23rd and 24th September, Tradecorp experts will accompany the Elgon team, our distributor in Kenya, at the Naivasha Horticultural Fair in Kenya. We will launch Phylgreen and discuss with visitors and customers the wonderful benefits of using Phylgreen seaweed on their crops especially on flowers and vegetables. Phylgreen is a liquid seaweed extract based on 100% Ascophyllum nodosum pure extract. 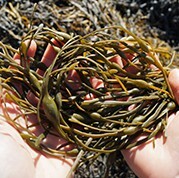 This brown seaweed comes from a highly stressful environment, subject to constant tidal action, and so the seaweed plant has developed a high number of anti-stress active ingredients to survive, such as alginates, mannitol and polyphenols, among others. The seaweed is harvested by hand in a sustainable way. In Tradecorp’s factory in Ireland, unique Gentle Extraction technology is used, a method of cold extraction, which preserves all the active ingredients from the seaweed without the addition of chemical substances. Tradecorp combines this unique technology with its experience in biostimulants and special fertilisers to create anti-stress solutions which nourish and enhance the metabolism of all crops. Naivasha Hortifair is Africa’s biggest Horticultural fair and it attracts audience from across the continent and Europe. The event will be held in Naivasha, Kenya, from 23rd-24th September.